Who doesn’t love to snuggle with something soft and cushy? 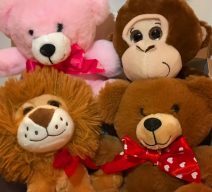 These furry friends are the perfect addition to any of our goodies and with a balloon bouquet. They are sure to bring many smiles to any age friend and loved one. Snowball the Plush Stuffed Bear! Bubbles the plush stuffed elephant! Samson the Plush Stuffed Bear! Jelly Bean the stuffed plush lamb!